At Solvang Tree Nursery L.L.C. 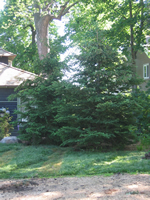 we specialize in the retail sales of large landscape trees We offer a variety of tree species in a range of sizes. The range of size options translates to a few installation options. Some of our customers have the means and ability to install some of our smaller stock, but the majority leave it up to the professional expertise of our nurserymen at Solvang Tree Nursery L.L.C. Since we offer a variety of sizes, we also offer a variety of service options. 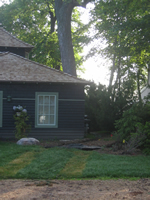 First, you pick out your trees or have our trained professionals pick it for you. Then you decide if you want to pick up & install or sit back and have our trained, professional staff, take care of everything. All you have to do is pick the spot and we take care of the rest. Delivery/install from Solvang Tree Nursery L.L.C. includes a property utility locate with diggers hotline, delivery of nursery stock to your site/property, proper hole digging with soil removal, correct installation of plant stock by people who deal soly with trees, and an initial watering in of plant stock to help with transplant shock. You also have the reassurance of our 2 yr. Guarantee* when Solvang specialists plant for you. Hand installation with ball carts. 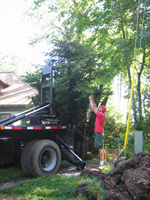 It is necessary to have adequate access for Tree Truck installation. When such access is not available, we are able to offer larger Balled & Burlapped Stock installed with a bobcat and hand installation. Call (608) 798-3212 or email solvang@tds.net to see what we can do for you.